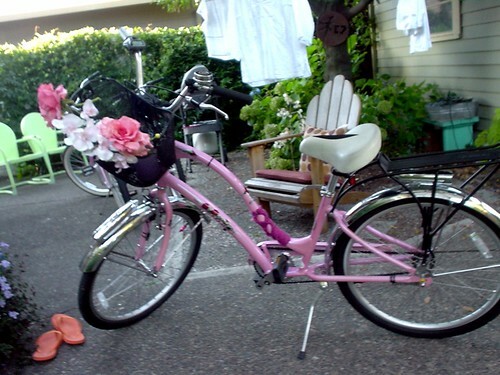 Lelo in Nopo: For the kindness of bloggers: a pink bike! Never did I imagine that my nonchalant Twitter about oogling over a Townie would lead to borrowing one from a fellow blogger. But it did! The awesome VJ at altportland saw my Twitter and offered me the opportunity to test one out by borrowing a Townie she had. And lo and behold, it was not just a bike. It was a work of art. And to say riding the bike was fun is an understatement. The great thing about a Townie is that you can sit upright on them. No leaning over, but comfortable upright riding. 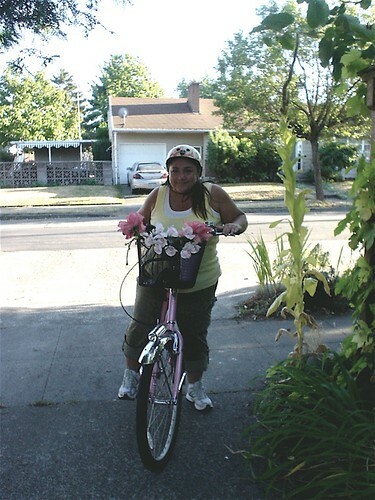 And since it was pink, and the helmet was pink, and it had a basket adorned with silk flowers, stickers, fenders and even a knitted cozy on its frame, I couldn't but help smile the biggest grin while toodling around North Portland on it. One ten-year old boy saw me and started laughing and elbowing his friend, and I just smiled and suggested he was jealous. I bet he was. Finally returned the beautiful pink bike today, and guess who has the same Halloween costume? That would be Echo, VJ's sweet shy puppers. Of course bloggers have cameras, and of course, we have a photo for you. My pleasure! I'm glad you enjoyed it! Great bike....and is that a Whippet?!?! 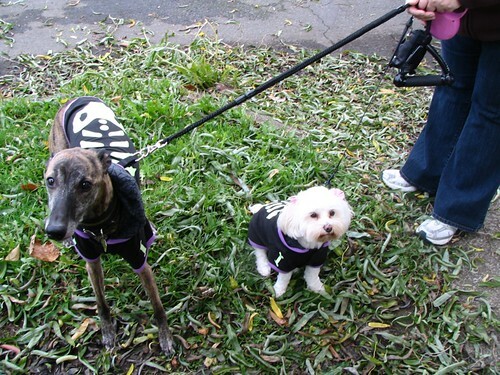 I just LOVE Whippets! I'm thinking that the whole reason I haven't ridden my bike AT ALL in 2007 is because it is a hybrid mountain bike (read: boy's bike!). If I had a girl's bike (say something like VJ's cool pink Townie), I'd be riding all over the place--and I could wear a skirt! I have a big long story of resentment I could get into about how my dad forced me to give up my beloved Schwinn Breeze (****girl's bike****) for a scary boy's 10-speed with about a millimeter of crotch clearance. I don't think I've ever gotten over that. So are you going to be getting a Townie of your own? I have a Townie (mine is baby blue) and I am MADLY in love with it. It's got style, grace and is super comfortable to ride. Even the big time mountain bikers that I know think it's awesome because it has suspension, a million gears, and a nice, light frame. Everyone should have one! I'm going to start referring to you as the social butterfly of the blogger world. That is so cool that you hooked up with VJ. 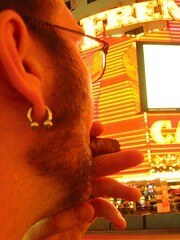 I keep hoping our paths would cross sometime in the future. And I intend to pout until I have one. Boy, I'm clueless, I had never heard of a Townie bike before. I've heard of townies (town residents as opposed to college students) but that's not the same meaning. You look so adorable on your borrowed pink Townie. Paint a few freckles on your face, add a skinned knee and a toothy gap in your big smile (missing tooth under the pillow waiting for the tooth fairy, of course) and you could pass for ten. You're right...I was jealous! I want to tool around on that pink beauty too.